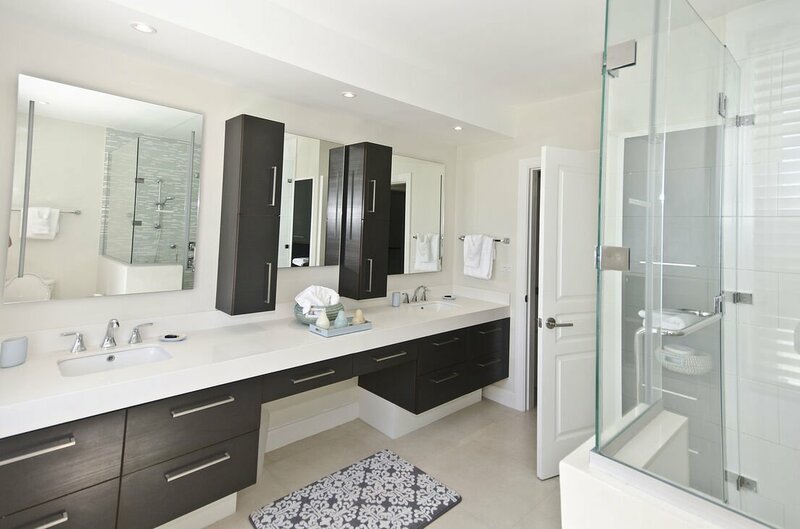 Paradise Bliss Villa by the Sea is a brand new four-bedroom luxury townhouse villa located right on the waterfront! The Villa offers absolutely spectacular views of the sparkling blue sea and picturesque views of the yacht club with boats and catamarans and their flowing sails. 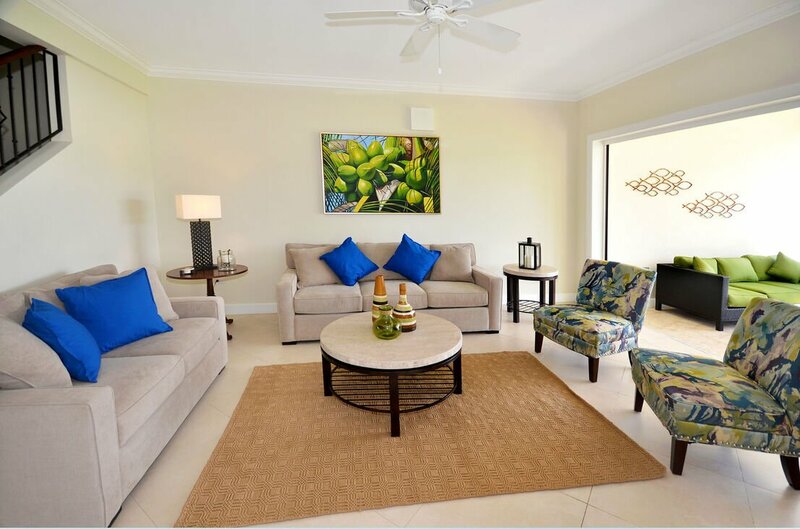 Covering an area of about 3,000 square feet, this luxury Villa has 4 bedrooms with luxurious en suite bathrooms. 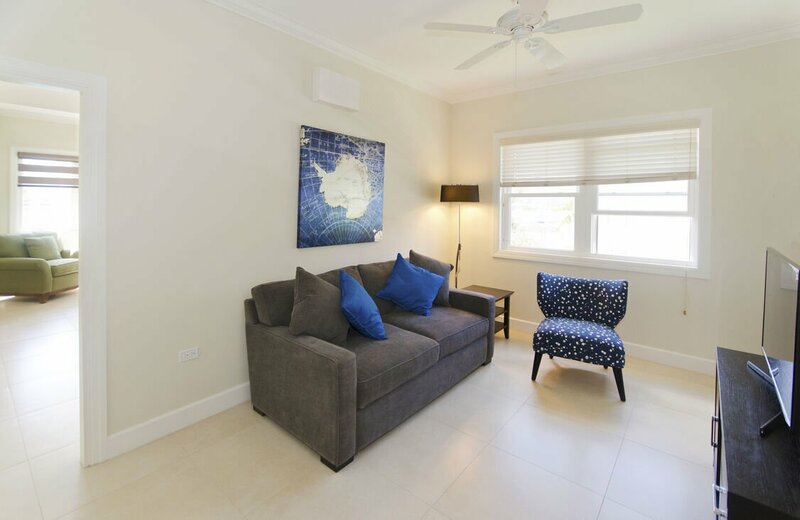 These four bedrooms can accommodate up to 8 guests while two additional guests can use the full size sleep sofa in the study on the first floor. 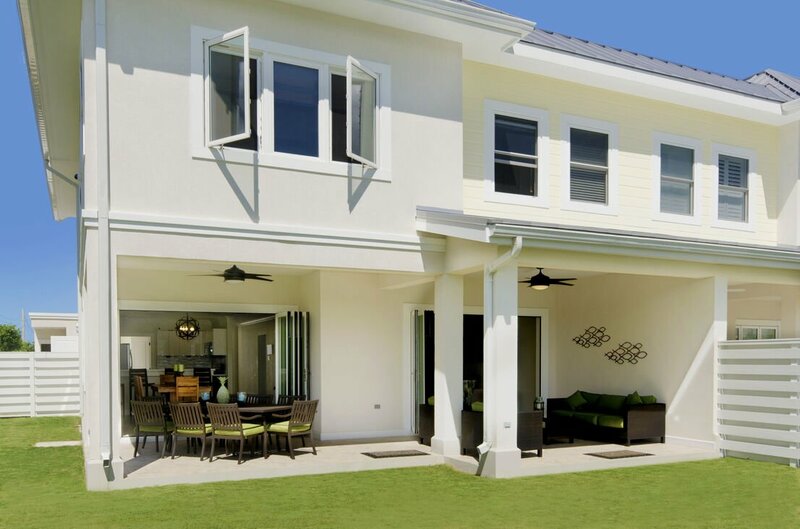 The Villa is positioned perfectly on the property, it is one of four townhomes by the water and at an end for privacy but still steps away from the pool, gym and gazebo. There is an expansive shared swimming pool near the water’s edge and after a refreshing swim in the large pool you can rest comfortably on the chic, modern lounging chairs on the deck. The poolside is also the perfect spot for morning coffee or before-dinner drinks! The pool is surrounded by a beautiful landscaped garden. Also adjacent to the pool is a covered gazebo equipped with blue tooth speakers and tasteful modern outdoor furniture. This gazebo juts out over the bay making it the perfect spot to spend long relaxing hours gazing at the sea! 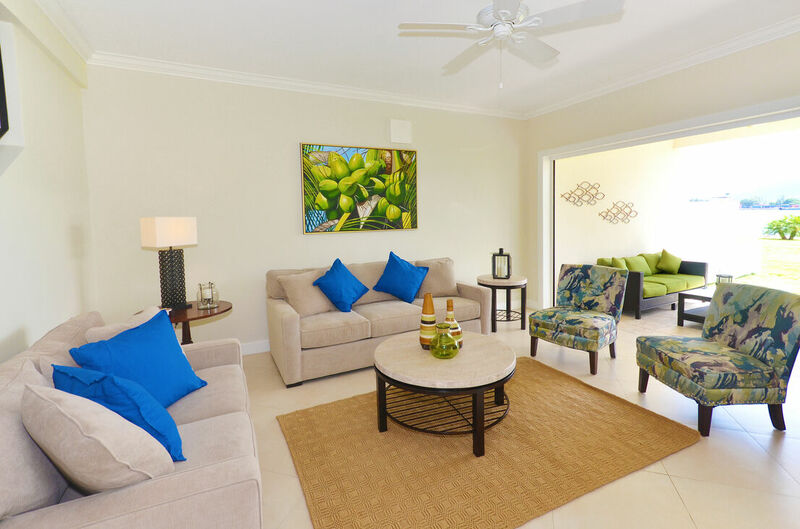 Paradise Bliss Villa has a spacious family room that is located on the ground floor. 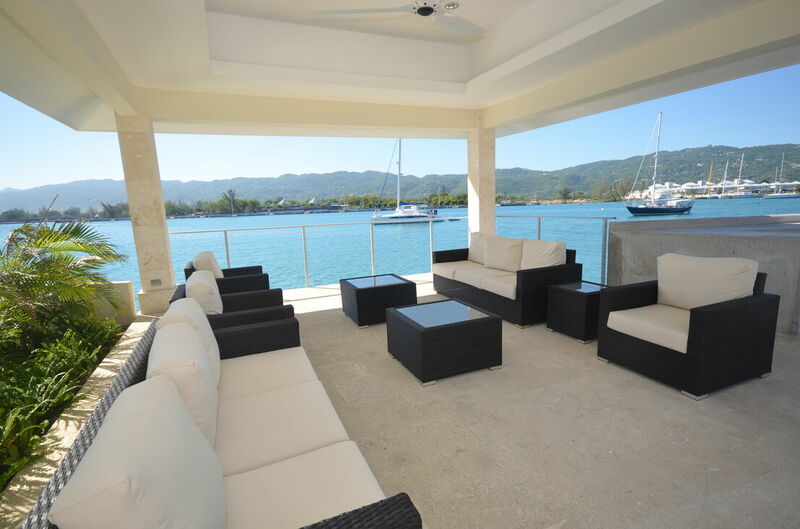 It offers absolutely spectacular views of the ocean and the Montego Bay Yacht Club. It has a 48” SMART LED TV with very comfortable seating for the entire family to spend time together while watching their favorite shows! Cable TV stations are available for a wide range of international TV channels and Netflix for movies. Complementary high-speed Internet is available throughout the Villa. The décor is casual and modern with comfortable sofas. 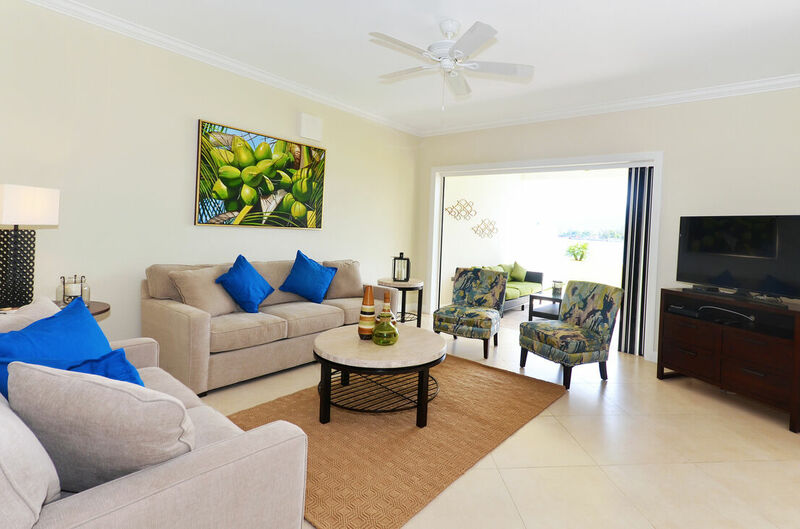 The folding doors and windows make the room bright and airy, while lovely Jamaican art add vibrancy. The dining room has a lovely setting and with the nearby patio dining table can cater for up to 16 persons. 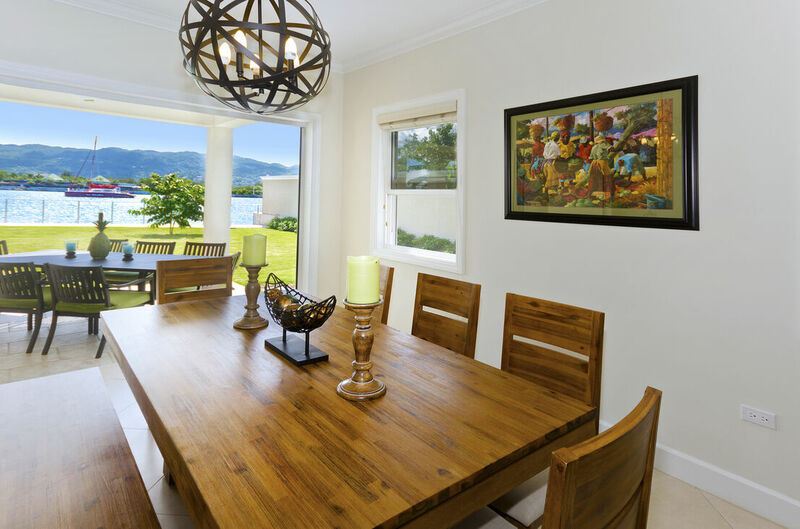 The family and dining rooms open to two spacious patios that lead to a large lawn by the water. 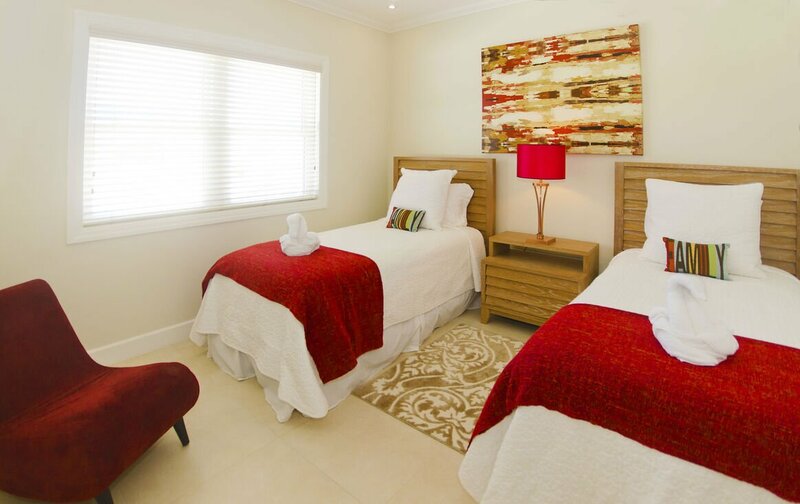 Paradise Bliss Villa has 4 spacious bedrooms and 4 luxurious en suite bathrooms. One bedroom is on the ground floor, while the remaining three are on the first floor. 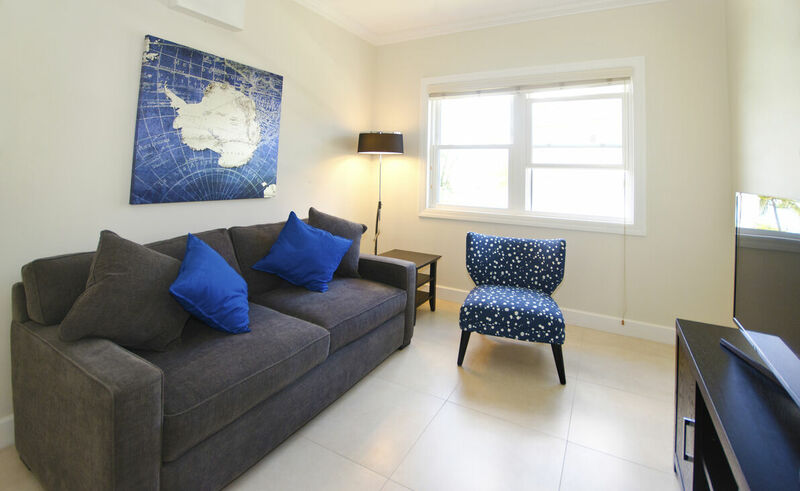 All four rooms have modern, large porcelain tiled floors, modern HD LED flatscreen TVs and split air conditioning. 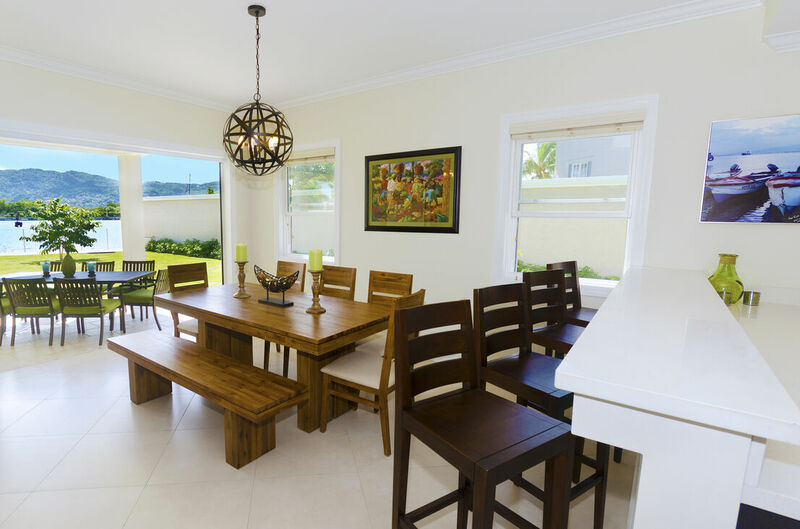 Modern furnishing with chic decor and Jamaican art give this Villa a beautiful aura, making it unique among luxury Villas in Jamaica. 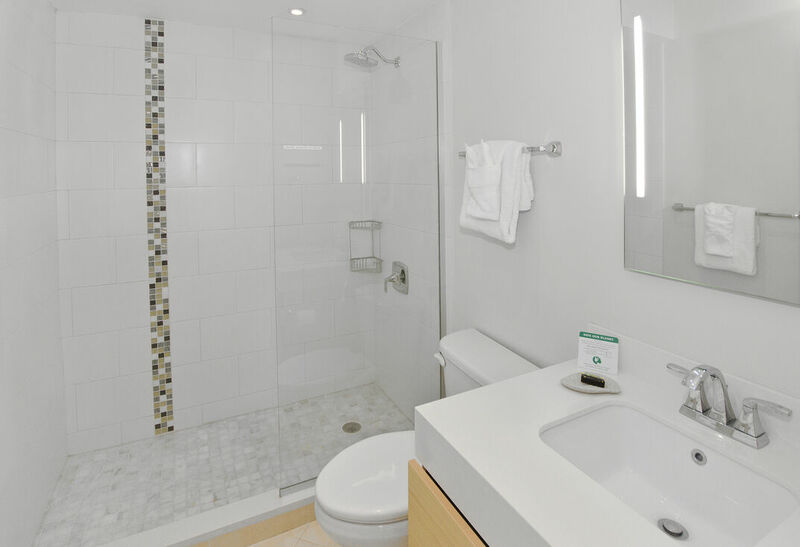 All the bathrooms have modern ceramic tiles with one bath/shower combination and 3 walk-in showers. 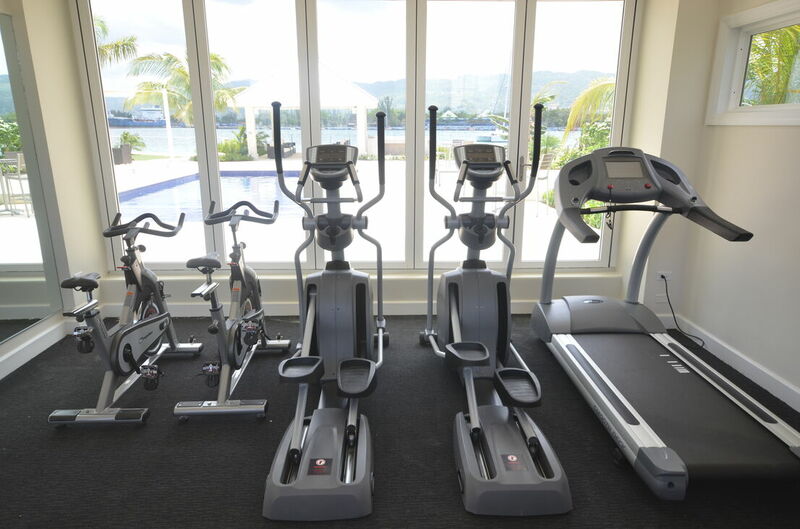 The onsite air-conditioned and well-equipped gym will help you remain fit even on your vacation. 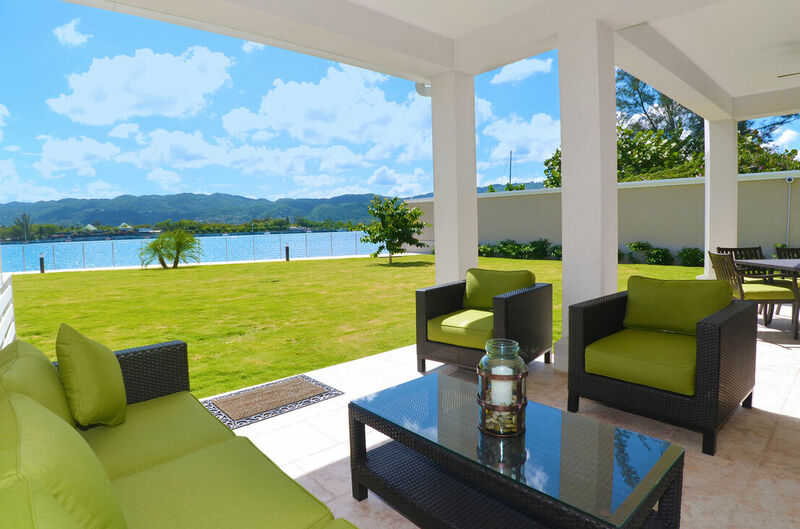 The gym, pool and gazebo are shared as part of this small, upscale residential community in the desirable area of Freeport, Montego Bay. 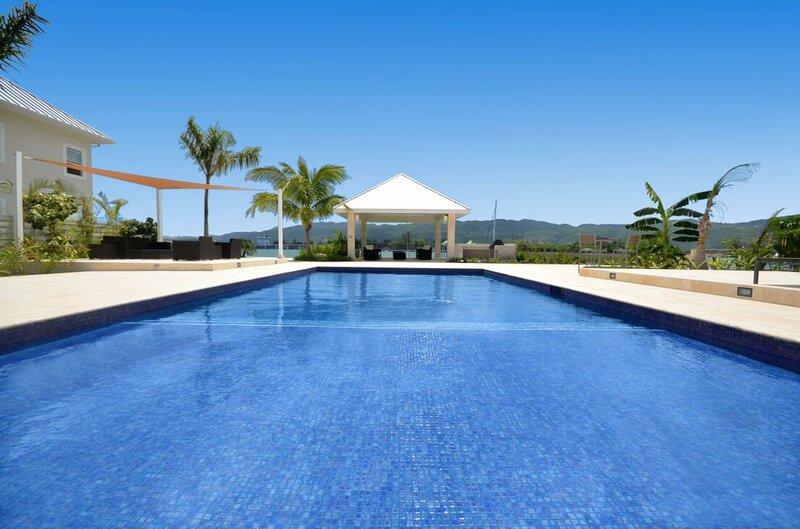 Although not often used, you or other residents may enjoy getting together by the poolside. 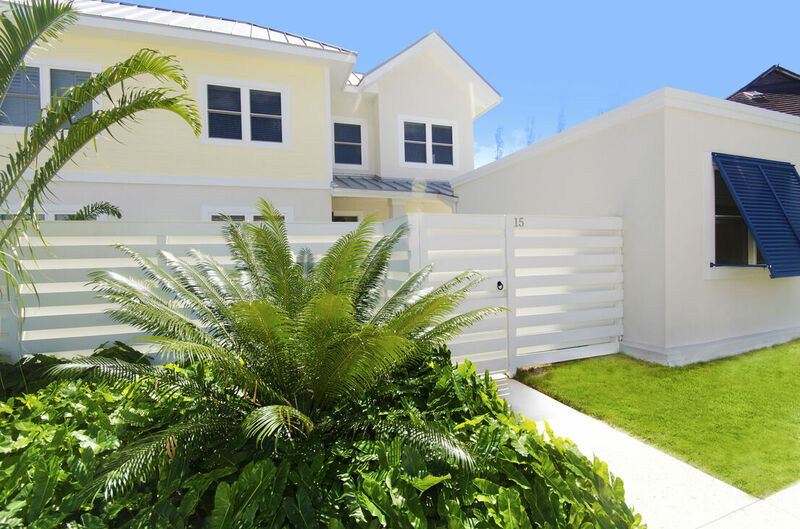 In addition, the villa enjoys 24 hour security in a secure gated and guarded community. It is only a 15 minute drive to the Montego Bay Airport. 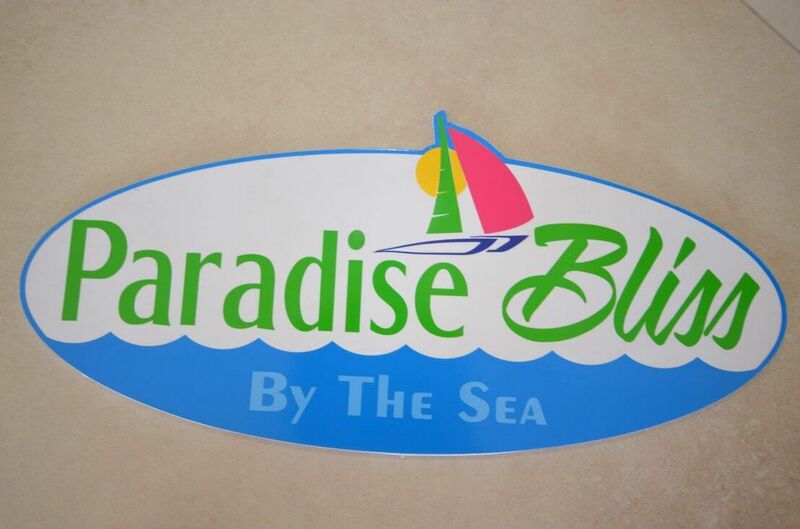 Whether you are staying 5 days or 5 weeks, Paradise Bliss is in fact a great secure place with super amenities for your vacation! The Villa is fully staffed with cook/ housekeeper! Their services are included in your rental fee. 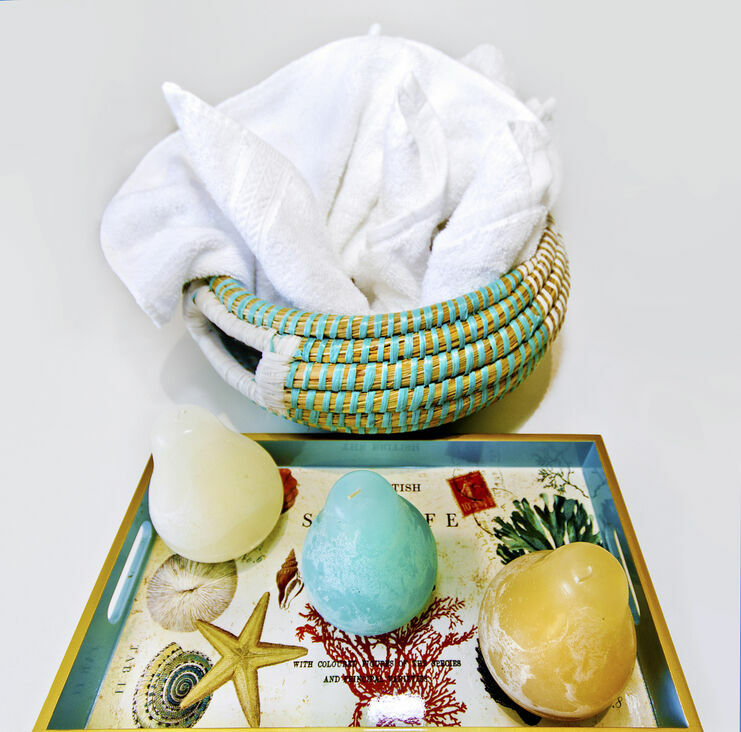 Prepare to be completely indulged and spoilt on this vacation! You will have a lot of time to get your much needed rest as all your household chores will be taken care of, from cleaning to cooking! 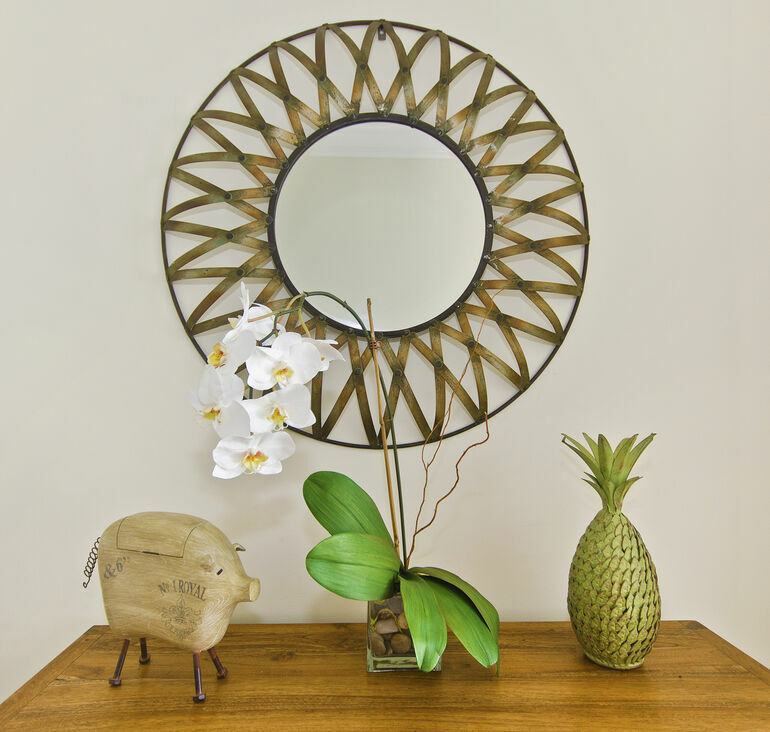 The staff will offer you a warm welcome and serve you with traditional Jamaican hospitality. 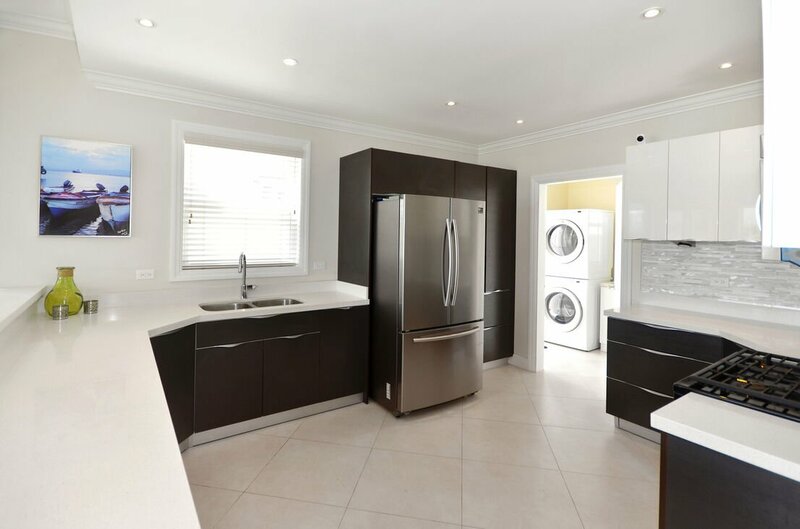 The kitchen is fully equipped and there is even a barbeque grill at the house so you can enjoy all your healthy grill dishes! 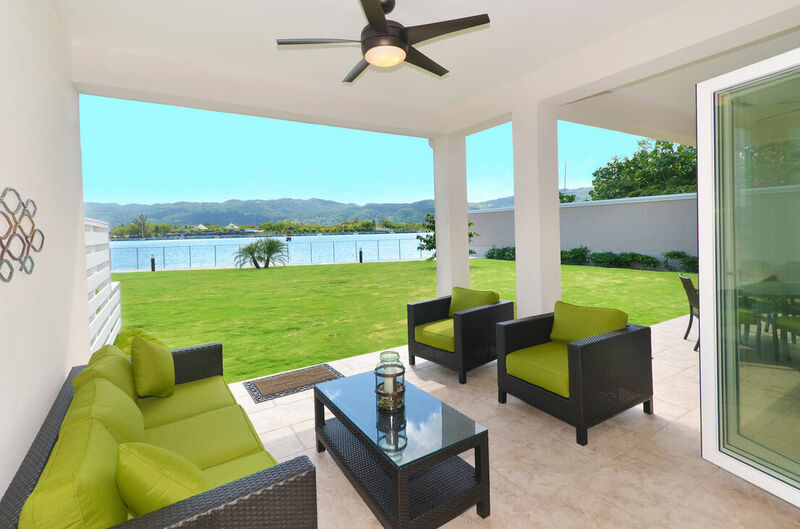 Tennis and boating enthusiasts will absolutely love the fact that Paradise Bliss Villa is only a 3-minute walk to the Montego Bay Yacht Club. Guests also have access to the Seawinds Beach Club which is only a 5-minute walk. A wide assortment of water sports including scuba diving is offered there. The Seawinds Beach Club offers beach access to a white sand beach and clear blue water alongside a resort style pool. Delicious lunch, dinner, brunch and drinks are available there seven days a week from both locations. The world-renowned Doctor’s Cave Beach (for a second beach option), about a 15 minute drive, is located on the Hip Strip where visitors can also enjoy the delectable cuisine offered by several restaurants or drinks at the many bars such as Bobsled Café and Margaritaville. 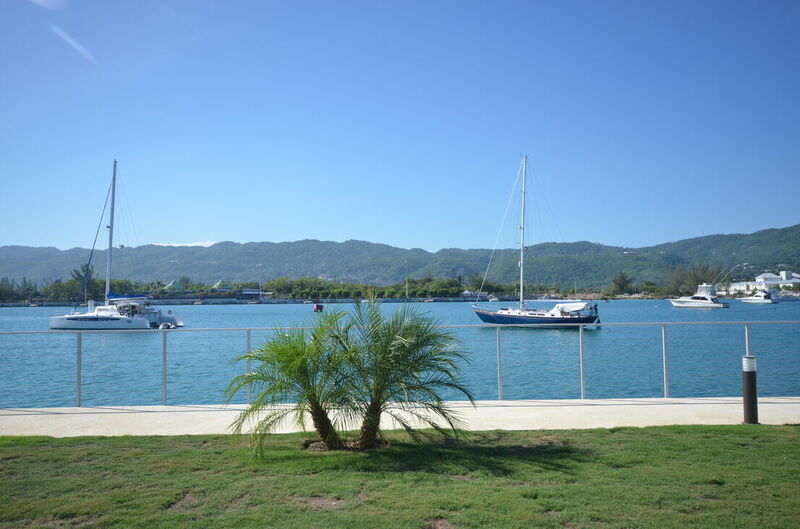 The Seawind Beach Club, Montego Bay Yacht Club and the charming Houseboat Restaurant are nearby choices for dining all within a few minutes walk away from the Villa. 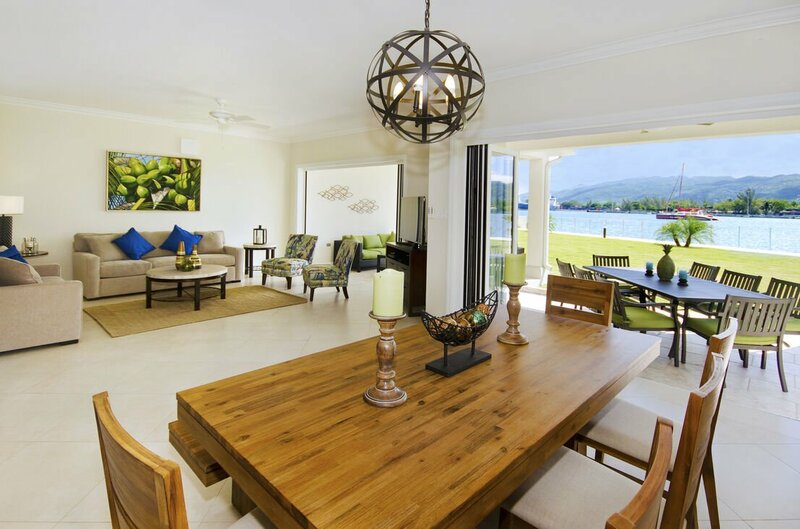 The central location of Paradise Bliss Villa in Montego Bay makes it very special among the luxury Villas in Jamaica. 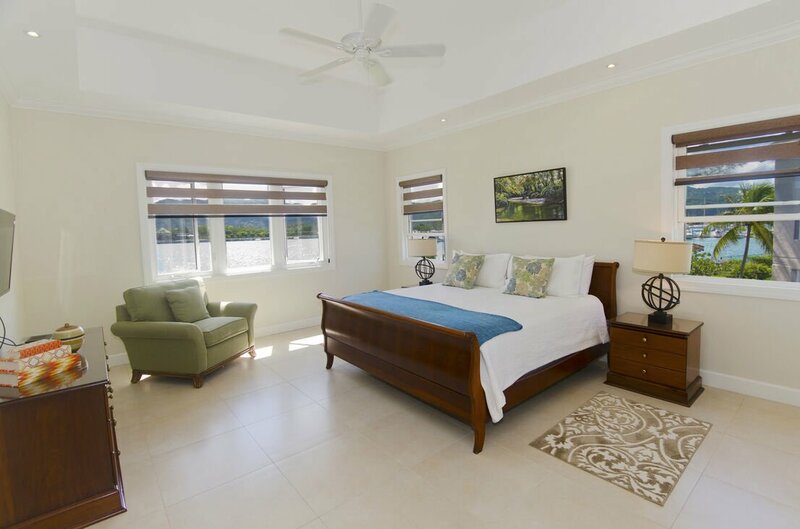 This Villa is a perfect location for day trips to Negril Beach, Rick’s Café, Mystic Mountain, the famous Dunn’s River Falls or for a visit to the Dolphins in Ocho Rios. Some important golf courses are also within minutes of Paradise Bliss by the Sea, they are Cinnamon Hill, Half Moon Golf, Tryall Club and White Witch Golf Course. Bedroom 1 ~ Located on the ground floor, the bedroom is furnished with a queen-sized bed and a 32" HD LED TV. There is a large window facing the garden and a generous size closet with drawers and hanging space for your personal items. 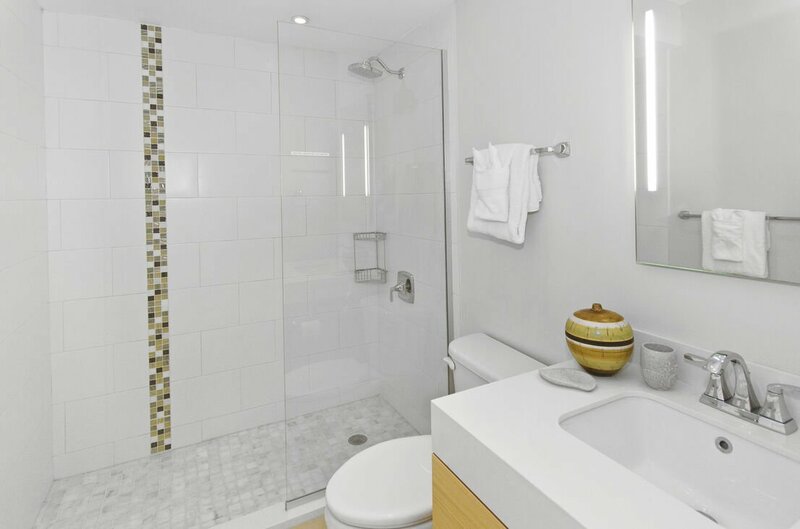 The size of the bedroom is 12 ft by 12 ft. and the bathroom has a walk-in shower. An energy-saving inverter air-conditioning unit and ceiling fan are there to keep you cool! 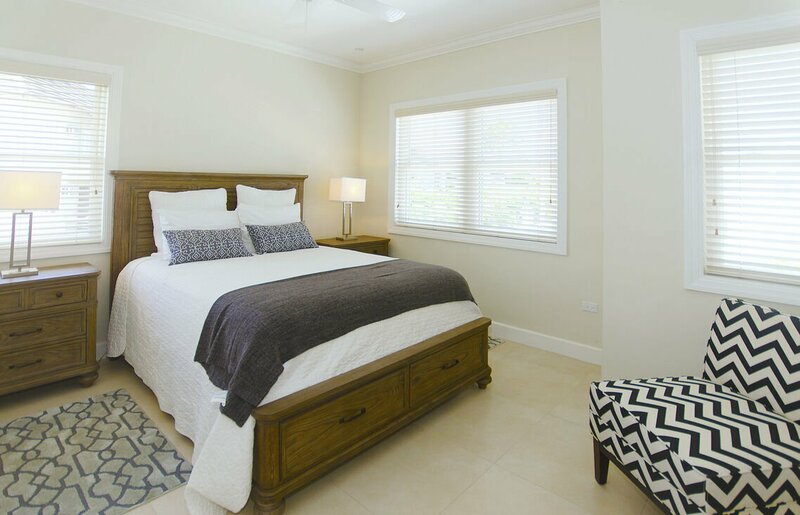 Bedroom 2 ~ Located upstairs on the first floor, the master bedroom offers the most gorgeous view of the sea. 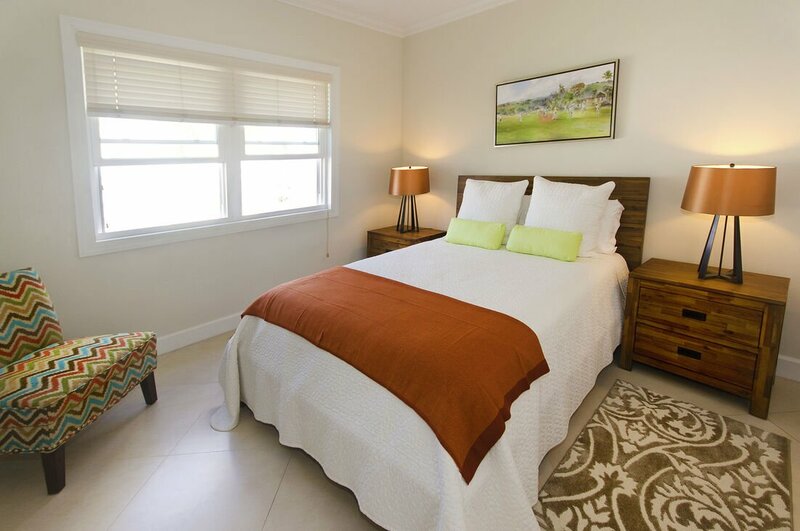 This luxurious room is furnished with a king-sized bed and a 40" HD LED television. This bedroom is large at 18.3 ft by 15.5 ft and has a large en suite bathroom with a glass door walk-in shower. 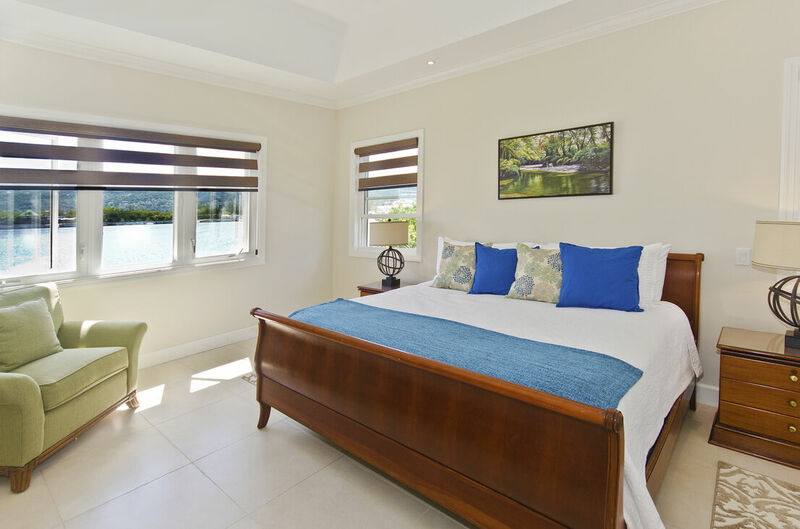 This master bedroom has wonderful 180° views of the Caribbean Sea, the mountains and the yacht club. This bedroom is bright and airy and has modern zebra blinds for privacy. The high ceiling, ceiling fan and new inverter air conditioning will surely keep you cool and comfortable at nights. There is ample storage space in the walk-in closet for guests. 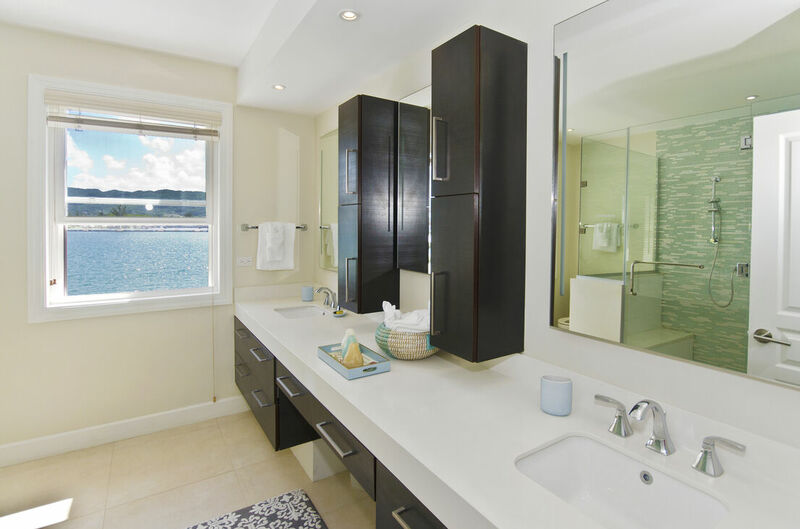 The bathroom has 2 vanity sinks with modern chrome fittings. Bedroom 3 ~ This is another gorgeous room with garden view. It is tastefully furnished with a queen-sized bed, ceiling fan and energy-saving inverter air conditioner. There is a flatscreen 32" HD LED television on the wall for you to enjoy your favorite TV programs with cable TV. The en suite bathroom has a walk-in shower. This is the second largest bedroom in the Villa at 13 ft by 11.5 ft. The 4 large windows make the bedroom bright and cheerful. It also has a spacious closet to keep your personal items stored away safely with a lot of clothes hanging space and drawers. Bedroom 4 ~ Also located on the first floor, the fourth bedroom is equipped with two twin beds, this room is suitable for two guests or a couple because the twin beds can be pushed together to make a king-sized bed. 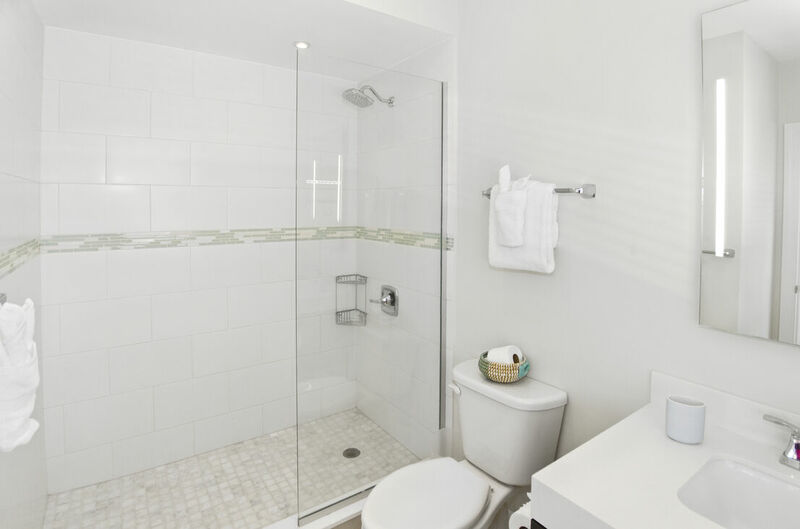 The en suite bathroom is very luxurious with bath tub/shower combination. This room also has a large closet and a 32” flatscreen HD LED television. It is quite spacious at 12 ft by 12 ft. with high ceilings and also comes with air-conditioning and a ceiling fan. All three bedrooms on the first floor open to a central hallway so parents and children have easy access to each other. Upstairs Study ~ Basically designed to be an extra TV area or work space, this can be used as an additional sleeping area for two more guests. There is a 40” SMART LED TV, a "full-sized" pull-out sofa bed and a chic accent chair. This area is not fully enclosed and is cooled with a fan only. The two additional guests can be accommodated for $50 per night, per person extra charge. 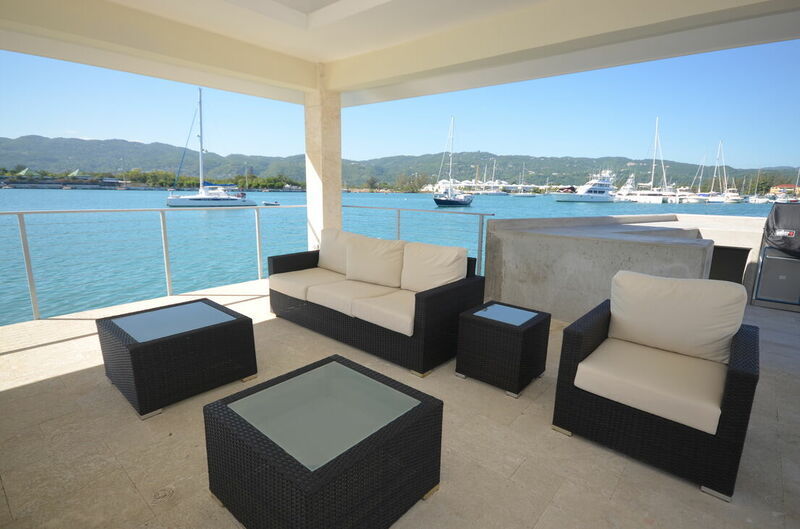 Enjoy lovely views from the large window that looks west towards the Montego Bay Yacht Club Marina and boats. 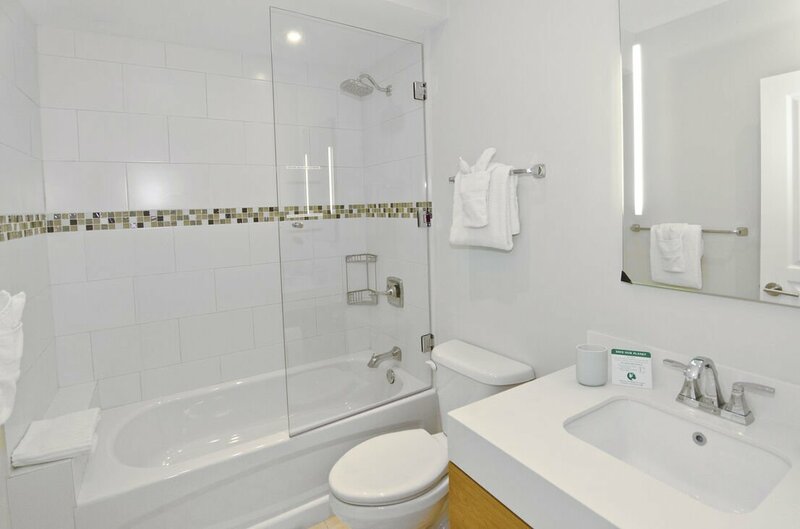 These guests can conveniently share the bathroom of bedroom 4. If you need transportation, you can make a reservation with the owner for airport transfers or a full-time driver from a reliable company. This villa has a no-smoking and no pet policy. Refundable damage deposit of $500 is required.